My Digbeth crawl was orientated stongly toward the heritage pubs listed by CAMRA such as the Anchor. 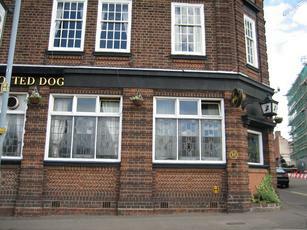 When discussing such a night out with the landlady of my B&B she mentioned the Spotted Dog. So, when I stumbled upon it I dropped in and was so glad that I did. The interior was full of character and dimly/warmly lit although its ornaments and artefacts seemed random and without any particular theme (not that they have to be, just telling it as I saw it ! ). Friendly, efficent bar staff and I was gobsmacked at £2.10 charge for my (very nice) pint of mild. Heritage price at least!! A lovely, warm, welcoming,atmospheric pub. A must visit on any Digbeth crawl. Rather enjoyed the on-line spat between reviewee and licencee. I'd have welcomed a classical performance on my Saturday afternoon - all quiet on the western front. Nice decor and lovely pork pie! Popped in here on Tuesday, which is Jazz night. This is a great pub in Digbeth. 2 roomed bar and an equally fantastic beer garden. Decent beers on and some are discounted on Jazz nights. Friendly bar staff. Holdens Black Country Mild £2.10, not discounted. Excellent Irish pub with a range of ales and a mild (only one cider). Will return. Yes I will yes. When we called on Saturday evening the pub was very busy with the post-football crowd and we were struck by the wide variety of customers as well as their, and the staff's, general good nature. It's a very friendly place to be, even for we strangers who were invited to dip into a large bag of excellent local pork scratchings. I have to agree with a couple of other comments - a greater ale range would be nice but the Ansell's mild was the first I had tried for many years, and was very good. There is an extensive and unusually pleasant smoking area. For me, this is a top place for a beer or three, only slightly let down by the limited choice.